The PK200 current-to-pneumatic (I/P) converter offers a low-cost method to convert a milliamp input (4-20 or 10-50mA analog signals) to a proportional pneumatic (air pressure) output. The unit is designed for a broad range of process control applications, including those that feature pneumatic actuating equipment. 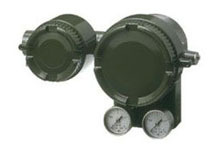 The PK200 features built-in stainless steel input/output gauges. The reliable PK200 performs electronic feedback control while maintaining accuracy of ±0.5 percent of span and linearity of ±0.2 percent of span. Built with energy savings in mind, the PK200 consumes only 4 normal liters/minute (4 NL/min) air while providing output air capacity of 110 NL/min. PK200 complements Yokogawa's existing line of Quality Solutions for its North American customers: pressure and temperature transmitters, flowmeters, on-line analyzers, recorders, digital loop controllers and an entire family of distributed control systems. Stainless steel bracket, epoxy coating, and other optional specifications allow the PK200 to be used in a variety of applications. Max. 4 Nl/min. or 0.24 Nm3 /hr at 140 kPa (20 psi) air supply pressure. Max. 110 Nl/min. or 6.6 Nm3 /hr at 140 kPa (20 psi) air supply pressure. Recent improvements in digital signal processing and network technologies have enabled advanced functions to be built into field devices, such as diagnostics and local controls, which could not be incorporated in traditional 4-20 mA analog field devices.